Rasawala aloo or aloo tamatar is a tangy tomato based gravy. This tangy gravy is perfect for poori. Simple recipe for rasawala aloo with step by step pictures. Making potato masala for puri is routine, but at times, I crave for tangy gravy. Mostly chana masala will be my choice if I plan prior. 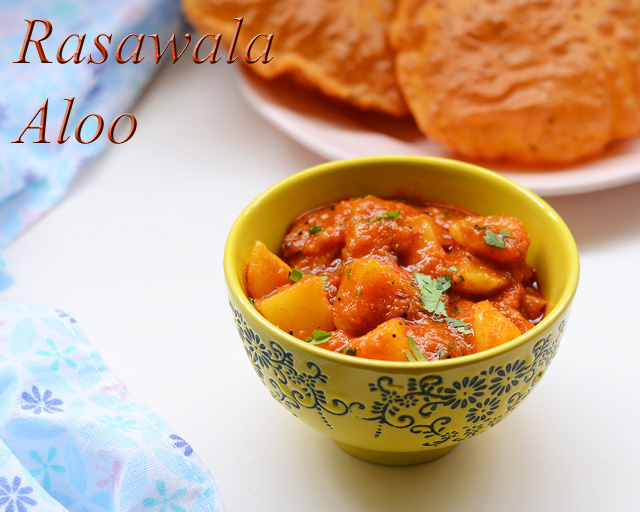 This rasawala aloo is a great quick fix for poori. I make a no onion no garlic aloo bhaji with methi flavour as we temper with methi seeds. This one is totally different flavour from my other aloo bhaji. First grind chopped tomato, green chilli, ginger to a smooth paste. Heat a kadai with oil and splutter cumin seeds, add asafoetida. In low flame, add all – red chilli, coriander, cumin seeds and turmeric powders. Take care not to burn and give it a stir. Add ground tomato mixture, sugar and salt. Cook till oil oozes out. Add cubed potato. Add 1 & 1/2 cup water and boil to reduce it to a fairly thick gravy. Garnish with chopped coriander. Sugar is added to balance acidity in tomatoes. Adding kashmiri red chilli powder gives nice colour.